Microsoft reveals UK launch date for Surface 2 4G tablet | What Hi-Fi? US tech giant Microsoft has confirmed the UK launch date for the Surface 2 4G – the latest version of its Surface 2 tablet that'll set you back an anticipated £539. Now available to pre-order through the Microsoft Store, the device hits the shelves on 8th May and comes with mobile broadband and wi-fi connectivity options. Features of the new Surface 2 4G include Xbox Music, the Windows RT 8.1 operating system and a NVIDIA Tegra 4 processor, which Microsoft says will make apps run faster. Meanwhile, the tablet will boast a 10.6-inch ClearType Full HD display rendering 1080p video and a dual-angle kickstand. It'll weigh just 10g more than its predecessor. New customers are being offered Skype calls to landlines in 60 countries and unlimited Skype wi-fi at 2 million hotspots worldwide for a year, plus 200 GB of free OneDrive storage for two years. 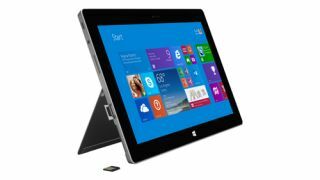 You'll be able to get your hands on the new Surface 2 4G from high street retailers such as selected Dixons' stores, as well as online.